Did you know there are hundreds of things you can make with things from the dollar store!? While shopping at the dollar store I realized what a hidden gem the dollar store actually was. You can make your DIY dreams come true. From hot glue guns, to cheap picture frames – the dollar store is where it's at. Of course, you'll need to pop by your local craft store for the more imperative things like Mod Podge and other essentials that you most likely will not find for 1$. 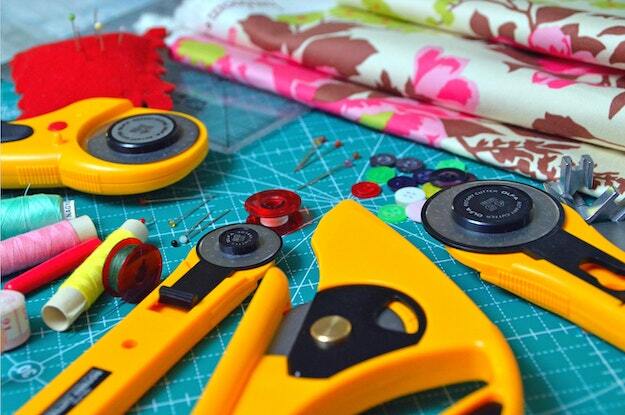 Crafting doesn't mean you have to break the bank. Check out all of these fun and exciting projects that you won't regret making. If you have any projects that you think we should add to our list – please let us know in the comments section below! We love adding new crafts to our list! This is my favorite project which is why it's at the top of my list. I cannot believe the similarities between the two mirrors. Probably the most inventive and impressive dollar store craft I've ever seen. Kudos to the original designer for figuring this out. I am definitely attempting this in my own room sometime this week. All you need – some paint cans and some mirrors! Enjoy! This simple project is fun and easy! The best part? It only costs $2. Go to your local dollar tree to pick up some materials. Full tutorial here. via dollar store crafts They've done it again! Look at this adorable wall hook made from a painted cheap plastic hook. The cost? We'll let you guess that one. I love the aged look of the hook itself. It almost looks like it could be ceramic. How do they achieve such a great outcome. I've got to try this one at home. The lovely Flamingo Toes blog featured a cool candle stick holder idea. Even if it's not for halloween I thought this idea was super fun. The tutorial is pretty straightforward and will definitely make for eclectic room decor. Check out how it's made here. Thanks to creatively living for posting this awesome 2$ tutorial! You can make beautiful garland in ten minutes! All you need is a little glitter and glue and some old linens to make this fun Holiday decor. Given that pallet wood is free and easy to find – these should only cost you $3 with jars from the dollar tree. I've been wanting to make these desperately for my bathroom for a very long time now. What I just discovered was that I can use these adorable jars from the dollar store to make my project come to life! I love the lids on the jars as well. I'll be the first to admit the dollar store has the best mugs. I didn't think so until I started hanging around one during times of desperation. I found their mug selection to be pretty extensive. The quality of the mugs is also pretty solid considering they're ceramic and only cost me $1. I really enjoy the idea of creating your own design on your mug like this one from ohhellofriend's blog. If you're like me, chances are your makeup is all over the place. I would like to think that I am a little more organized that that, however, it's not the case. The problem is that makeup storage can be costly. Fear not compadre's! We've discovered dollar store jewelry and makeup organizers to save your life. Check out how their made by visiting the thiscasita's fantastic blog. These little glass paperweights are so effortlessly amazing. I've always enjoyed the shabby chic look. Here's a fun way to re use old glass jar lids and turn them into mini paper weights. All you need is a little Mod Podge and some pourable resin to set the “glass.” Thanks to modpodgerocksblog for this fun and creative idea! Like this post on dollar store crafts? Know any other cool dollar store crafts that we can add to our list? Please leave us some awesome feedback in the comments section below and we will do our best to get it on the list! What do you think of this post? Share your thoughts and opinions below. Have you subscribed to the DIY Projects newsletter yet? Of course, we highly recommend it. Want the scoop on more fun craft projects? Make sure to follow us on Facebook (button below) to get all the latest and greatest project updates! Pin It to Pinterest to share with friends. Do you want to see our favorite DIY Blogs? Check out our post on Sites With Bragging Rights. Thanks and we hope you enjoyed our post on dollar store crafts! I saw a cool alternative to a wreath on ETSY but is was $40 so i made it myself for less than $10. Everything came from dollar tree except one item. I got a large wooden letter cut out from the craft store. Picked up 3 spools of nylon rope (original was jute rope but the nylon was white and blue and has life to it), a clip on red bird. Wrapped the rope around the letter. Glued where needed, added a loop to hang it with and glued on the bird in the corner (original had a paper flower). I can send a pic if you would like. It is so cool! The letter was about 10″. Also took me less than 2 hrs. Bulk took an hour. Details in wrapping the corners took the other hour.